The greatest leaders and geniuses in history were mischief makers. They were the brave women who looked at how unfair the world was and said, "I can do better than that." They were the stalwart men who saw stupidity and asked, "Why do we have to do it that way?" And they were the delightful children who ganged up on the neighborhood bully and hit him with wet noodles until he said, "Uncle "
Yes, history's mischief makers had the courage to point out that things like slavery, global warming, and turtleneck sweaters are bad. And they also pulled off some of the greatest hoaxes and practical jokes of all time. Their achievements include the Boston Tea Party, the "War of the Worlds" radio broadcast of 1938, and the Cheese Whiz Disaster of 2008. 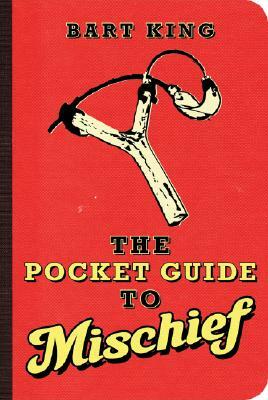 In honor of them, we introduce The Pocket Guide to Mischief, the perfect addition to any prankster's collection, as well as a fun-filled how-to for the budding troublemaker in all of us. Bart King, a self-proclaimed "dabbler," is interested in games, magic, current events, music, chess, history, literature, geography, travel, crime, science fiction, art, and almost everything else The veteran of many water-balloon wars, he's twice won the prized "Arrested Development" award from the New York Society of Amateur Psychologists. He earned a master's degree in history from Sonoma State University and has taught middle school for the past fifteen years. Bart's work has been featured in The Oregonian, The Portland Tribune, Chicago Parent, Family Fun magazine and many other publications. He has also appeared on dozens of television and radio programs including the widely syndicated "Bob and Tom Show." Not only is Bart a wild and crazy boy, he's also the author of the bestselling Big Book of Boy Stuff. Bart subsequently co-authored The Big Book of Girl Stuff with his five sisters and 50 former students. This title won widespread acclaim; if you are skeptical (and you should be ) please see its product page.